Interim UO President Scott Coltrane and other university leaders are back from a trip to Washington, D.C., where they advocated for sustained student aid and federal research funding. 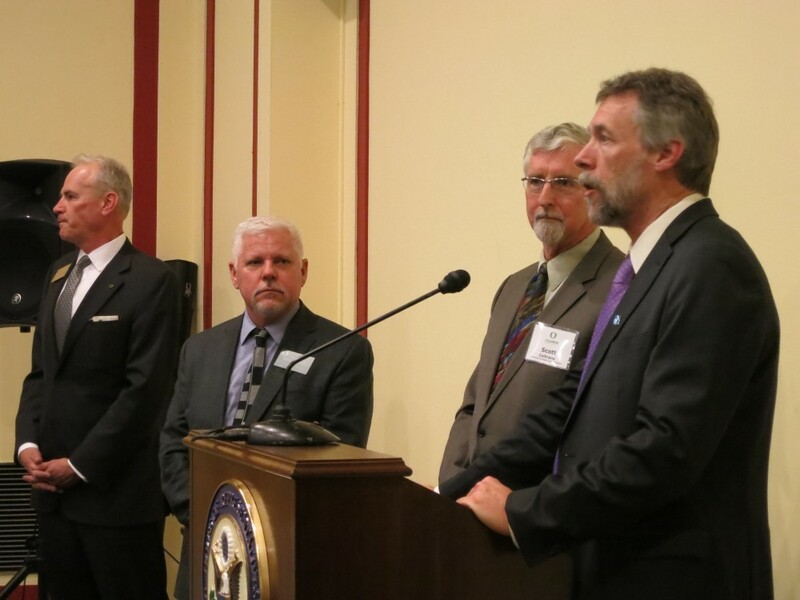 Coltrane, interim Vice President for Research Brad Shelton and College of Education Dean Randy Kamphaus met with members of Oregon’s congressional delegation to convey how federal funding is critical to UO students and to the ability of UO researchers to make discoveries. Congress is just beginning consideration of the fiscal year 2016 budget. UO students relied on $175.7 million in federal student aid in 2013-14. Thirty-eight percent of Oregonian students at the UO receive federal Pell Grants to help pay for college. Altogether, 5,414 lower-income UO students benefit from $22 million dollars in Pell Grant aid. Coltrane thanked Oregon members for supporting student aid and urged them to stabilize the program to maintain access for students in need. UO leaders talked to lawmakers about the importance of funding federal research agencies, as well as some of the special opportunities associated with the federal budget that could make a difference for the state. These opportunities include expanding funding to the U.S. Geological Survey for a West Coast earthquake early warning system — whose sensors support research as well as detection of seismic threats to the public — prioritizing funding for the National Center for Special Education Research and continuing U.S. Department of Agriculture investment in advanced wood manufacturing and design. The UO recently expanded its role in earthquake early warning systems by agreeing to take over responsibility for 15 seismometers previously deployed by the National Science Foundation for scientific research and redeployment later this year. The seismic network is a cooperative agreement between the UO and the University of Washington, and the UO is a key player in the development and testing of a West Coast earthquake early warning system. The visits followed Coltrane’s participation in the annual Association of American Universities spring meeting for presidents. Advocacy for federal student aid and research takes place in coordination with the AAU and the Association of Public and Land-grant Universities. As Congress wrestles with budget matters, some important research agency authorizations are also under consideration. Authorizations set the blueprint for agency spending over a multi-year period, while appropriations are the annual allocation of funds to agencies, often below authorized limits. This was Kamphaus’ first visit to Washington as dean of the College of Education. In addition to participating in Coltrane’s meetings, he joined his AAU counterparts in meetings of the LEARN Coalition. He said he appreciates the reception he received from the Oregon delegation. Also as part of the visit, Coltrane, Kamphaus and Shelton were joined by other UO leaders for the annual D.C. Ducks alumni gathering. The National Capital Chapter of the UO Alumni Association brought together alumni and supporters to talk with leaders, ask questions and learn about the goals of the university’s fundraising campaign.